Habit: Subshrub <= 2 m. Stem: branched throughout. Leaf: 2--5 cm, linear to thread-like or with few thread-like lobes, abaxially glabrous or puberulent, resinous, adaxially grooved, densely minutely puberulent in groove. 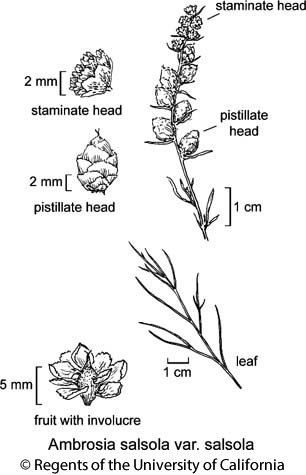 Inflorescence: staminate and pistillate heads +- sessile, mixed, or staminate +- distal to pistillate, 1 or in tight groups on short, spike-like branches; staminate head 2--4 mm diam, phyllaries 4--8, +- glabrous or puberulent; pistillate head 1-flowered. Fruit: bur 3--6 mm, body widely fusiform; wings 5--18, whorled or spiraled, 2--7 mm, often reniform. Note: Hybridizes with A. dumosa. Varieties intergrade. Inflorescence: pistillate head phyllaries generally several, ovate, green or transparent, +- hairy. Fruit: bur wings (6)10--13(18), spiraled, generally 3.5--5.5 mm, 3.5--6.5(8) mm wide, spreading from bur body or ascending and enwrapping bur. Synonyms: Hymenoclea salsola Torr. & A. Gray var. salsola; Ambrosia salsola var. fasciculata (A. Nelson) Strother & B.G. Baldwin; Hymenoclea salsola var. fasciculata (A. Nelson) K.M. Peterson & W.W. Payne; Hymenoclea salsola var. patula (A. Nelson) K.M. Peterson & W.W. Payne, illeg. Citation for this treatment: David J. Keil 2012, Ambrosia salsola var. salsola, in Jepson Flora Project (eds.) Jepson eFlora, http://ucjeps.berkeley.edu/eflora/eflora_display.php?tid=80424, accessed on April 19, 2019.
s SnJV, s SCoRI, SW, s GB, D; Markers link to CCH specimen records. Yellow markers indicate records that may provide evidence for eFlora range revision or may have georeferencing or identification issues. Purple markers indicate specimens collected from a garden, greenhouse, or other non-wild location.